Take a stroll down a hidden alleyway off one of the main streets in the Dorset market town of Bridport and you might just stumble upon this ‘hidden gem’ (as attested to by a million tourists). 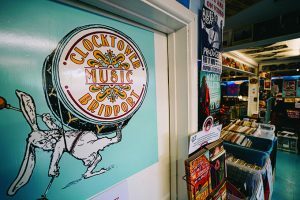 Walking into Clocktower Music, you’re met with a warm welcome and a sensory explosion. 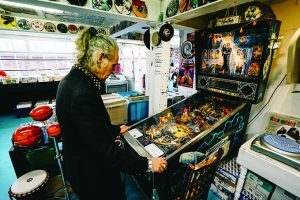 Looking a bit like a retro US warehouse, Clocktower is home not only to crates and crates of pre-loved records of all genres, but also shelves full of kitsch – including a jukebox, pinball machine and vintage listening post… its roots as an antiques shop may have a lot to answer for there. Now run by Roy Gregory and a team of staff and volunteers, the shop retains elements of its former self with a range of Bluetooth-enabled vintage radios, sold only in the shop, for around £100 a pop. 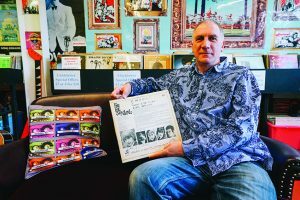 A national music magazine dubbed the fair – which Roy named ‘Vinyl Saturday’ – the best in Europe, helping to attract record buyers from further afield. With the success of the quarterly markets, Roy started considering where to go next. While the shop attracts a lot of predominantly men of a similar age to Roy and his team (there are at least a dozen people browsing on the wintry Thursday when we visit), there’s been a significant increase in teenage girls buying cassettes to play on second-hand Sony Walkmans, or old music magazines. He adds: “Buyers are getting younger. 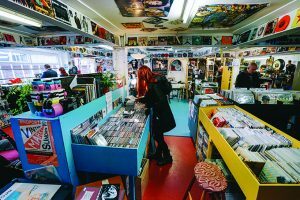 A lot of under-30s download music and buy vinyl, but there’s almost a missing generation between 1986-2006.
the best in any record shop in the UK. Quite an accolade. Opening from Wednesdays to Sundays allows Roy (who was technically retired from the financial services industry when he got himself into the Clocktower venture) a couple of days off a week. It also means the shop is busier on the days it is open. Flash sales are another Clocktower trick to attract custom. 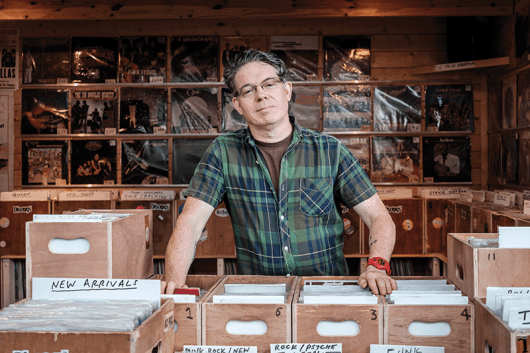 As he puts on a Nick Cave record at the request of a customer, Roy explains: “Every now and then, we do a three- or four-hour flash sale – so we’ve done one today on CDs, where between 11am and 4pm, there’s a 50% discount on CDs. We just announce it on social media, very quickly, literally the day before and it gets people in. “We tend to sell more during these sales… but this is so much fun, that’s why we do it. It’s the conversations. There was a lady who came in the other month who was the first person I’ve met who saw The Beatles at Shea Stadium. Clocktower also plays host to live music from across the world. “The last one was a Japanese indie band who flew in on the Wednesday, did their album launch here on the Thursday, did a couple of radio shows on the Friday, then a gig Saturday and Sunday and flew back to Japan on the Monday. 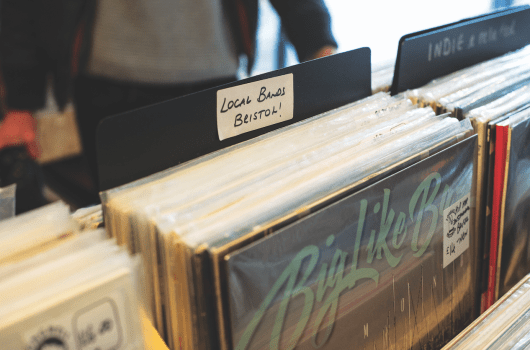 The shop also hosts gigs and records by local artists and has become an important part of the local arts scene – attracting visitors from across the world – but although there are over a dozen places you can pick up vinyl in Bridport, there is only one Clocktower Music. 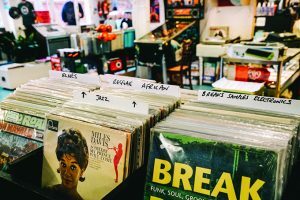 In closing, Roy offers a few tips if you’re tempted to have a dig next time you’re in town: “We’ve got Bridport Music, another independent record shop. 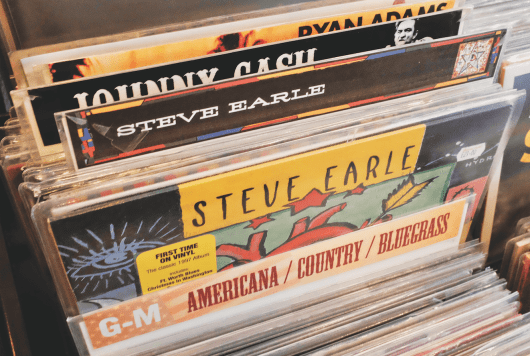 They do new vinyl, so we send people up there for that and they send people down here, too. We do hi-fi repairs, but we send people up there for the styluses. If anyone comes in with guitar stuff, we send them up there. It works really well.